Scotch eggs are one of those things that I have never made myself. I’ve bought ones in the past but I have often been disappointed as they have frequently been insipid; lacking in flavour with a claggy filling and a grey tinged egg yolk inside. The best one I have ever had was from the Dog and Partridge on Trippet Lane, they were truly legendary and massive. The basket piled high with warm home-made scotch eggs by the bar was often too hard to resist. 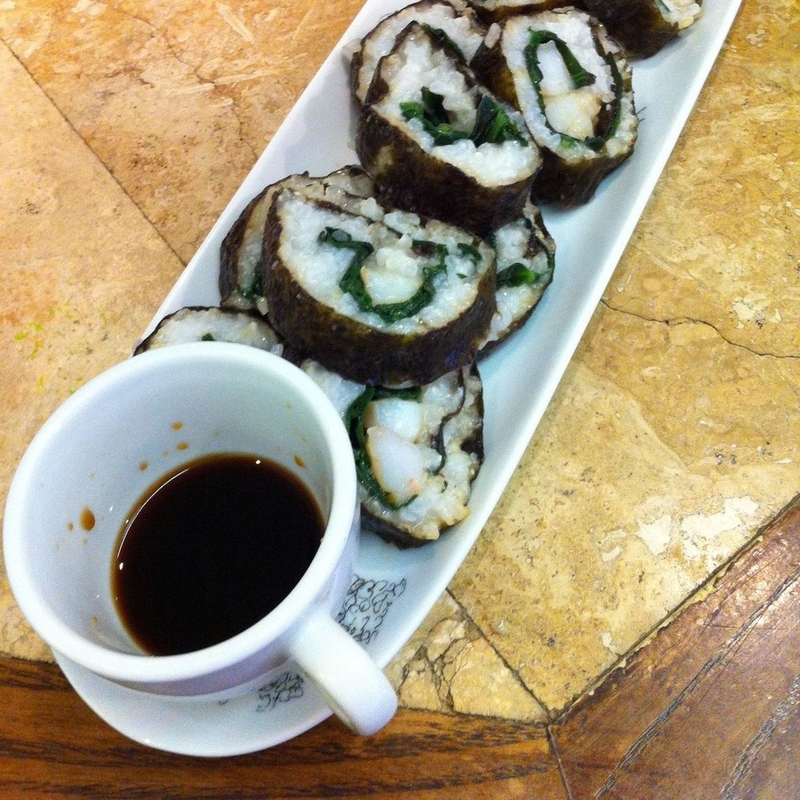 They were perfectly crispy with tasty well-seasoned meat encasing the egg. The Scotch egg arguably has it’s origins in Scotland although there are claims that Fortnum & Mason created the portable egg snack in 1738. 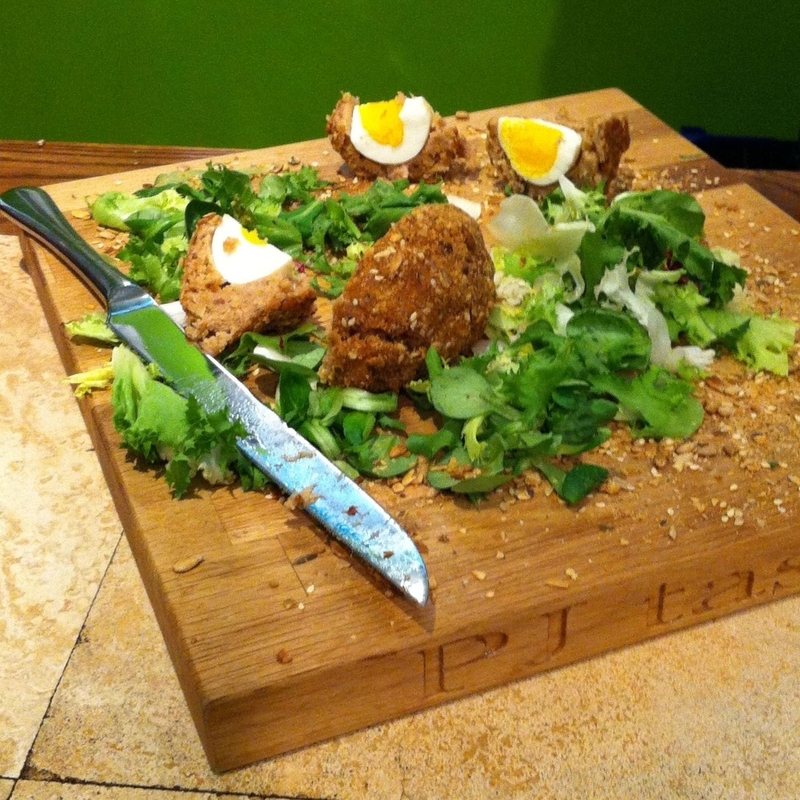 The history bit aside the conventional Scotch egg is usually made by covering a boiled egg with an herby sausage meat, which is then rolled in seasoned breadcrumbs. This is deep fried in oil until crispy and golden brown, then served warm or cold. Well, Peter at PJ Taste took on the task together with 17 year old Michael Dungworth, a student of the Peter Jones Enterprise Academy to create what I believe to be the first Sheffield Egg. Michael has chickens at his allotment and as part of his studies he was given a project to develop a product to sell. In simple terms this meant – Michael’s chickens = eggs. Eggs + PJ Taste + local food producers (Moss Valley Fine Meats et al) + Cindy Cheung design = Sheffield egg. This egg wasn’t a scotch egg in a pure sense although it did resemble one. The free-range egg was encased in Moss Valley sausage meat seasoned with Yorkshire cheddar and a dash of Henderson’s Relish. Then the outer shell was created using breadcrumbs and crushed seeds. Before the official launch of the Sheffield egg we enjoyed several different canapés. As ever with PJ taste these were inventive and unusual. They included tempura nettle leaves with a wild garlic pesto, sushi with king prawn, sea beet and a wild garlic bud, Moss Valley pork tenderloin smoked using lapsang souchong tea served on Cat Lane ciabatta, and paneer cheese with a crispy coating of seasoned gram flour. The nettle was my favourite as they looked so striking; the leaves retained their shape in the tempura and became an ideal natural scoop for the wild garlic pesto. The taste was fresh with subtle garlic tang. The rest were delicious too and the tenderloin was nicely moist with a hint of sweetness, with the crisp ciabatta providing the perfect contrast in texture. To mark the laying/creation of the Sheffield egg, Sylvia Dunkley the Lord Mayor of Sheffield was on hand with the ceremonial knife to cut the first egg. We then got to try some as plates were brought round with tasters. I enjoyed the crunchy seedy shell and the soft nicely seasoned meat and egg were really flavoursome. The smartly packaged Sheffield Egg designed by Cindy Cheung was then unveiled and of course I had to get one for an edible souvenir. When Michael is famous I will say that I bought one of the first eggs! The eggs will be on sale in PJ Taste (and Urban Pantry in Crookes) if you want to try one yourself, they are retailing at around £2.49. The evening was rounded off with a specially written song called ‘An ode to the egg’ performed by the aptly titled ‘Hen dub and Yolk Ono’. It was a brilliantly crafted story all about PJ taste and someone coming in and enjoying a Sheffield egg. Witty and well performed, if not a bit surreal. To sum up it was great to see the who’s who of Sheffield food gathered together for the Sheffield egg launch – Urban Pantry, Moss Valley Fine Meats, Our Cow Molly, Sheffield Honey, Catherine’s Choice, Sheffield Telegraph, Eat Sheffield, Clare @FeastandGlory, Cindy Cheung and fellow foodies Fiona Stewart & Frankie Roberto. It was an eggcelent evening full of eggtremely tasty food. OK, I’ll get my coat and leave you with a video of a huge scotch egg.